San Francisco Bay is truly one of the best, and most challenging, sailing venues in the world, with over 400 square miles of intense, exciting and exhilarating waters made up of strong summer winds, powerful tides and currents, fog, commercial traffic and varying temperatures that can shift 20 degrees in a single day. Whether racing or pleasure sailing, it’s important to be aware of not only wind conditions but also tides, currents and predicted time of the marine layer clearing. Click on the weather related icons on our Resources page to check current conditions in the San Francisco Bay Area. There are also many Apps for smart phones now that can give you fairly reliable weather, tide and current conditions as well. Be aware that on any given day, you can be navigating in places where the winds are light and the sun is out and it’s t-shirt and shorts weather, where only 1/2 mile away it’s gusty winds and foulies time. 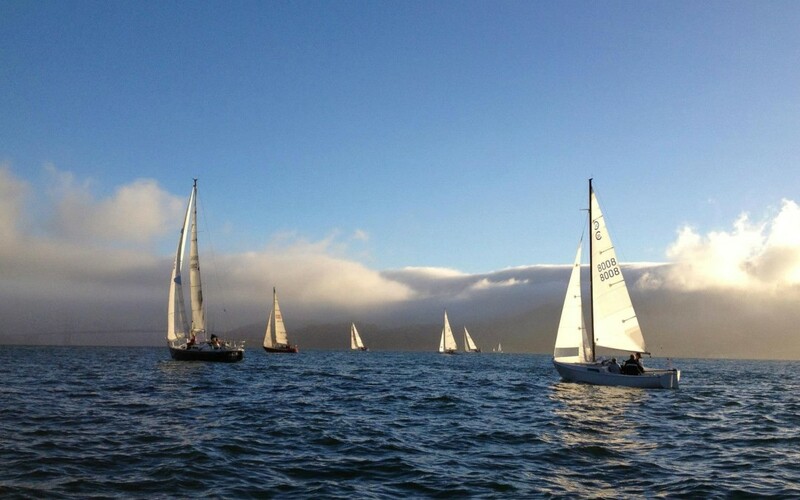 What drives San Francisco Bay sailing weather? The climate of the San Francisco Bay Area is broadly classified as a Mediterranean Climate, which generally means that summers are dry, sunny, and warm with average temperature on the water in the high 70s to low 80s while winters are usually mild and moist with occasional storms. The Bay Area has several micro-climates which lead to significant differences in temperature, winds, and fog patterns over relatively short distances. Several factors come into play to create these micro-climates, namely the variations in air mass between land and sea and the complex terrain of the coastal mountain ranges. Gaps in the coastal mountain ranges further modify weather conditions on a local scale. During the summer months, inland heating from the Sacramento Valley can create strong winds. In winter, the winds tend to be lighter and come from varying directions.